The Gulf of Mexico Research Initiative congratulates Dr. Clint Dawson, Professor of Aerospace Engineering and Engineering Mechanics and Edward S. Hyman Endowed Chair in Engineering at the University of Texas at Austin, for receiving the Society for Industrial and Applied Mathematics (SIAM) Career Prize in Geosciences. SIAM, which has several areas of focus for Applied Mathematics, honored Dawson for his body of work on coastal modeling at the Conference on Mathematical and Computational Issues in the Geosciences at Padova, Italy in June of this year. With more than 20 years of experience in numerical studies of coastal ocean transport processes, Dawson serves as the leader of coastal modeling studies for the Consortium for Advanced Research on Transport of Hydrocarbon in the Environment (CARTHE). Dawson and his team are using coastal circulation models to understand the combined processes of wind, waves, and currents that caused oil from the Deepwater Horizon incident to move from the seafloor to the surface and across the continental shelf to shorelines. They are also applying coastal circulation models to understand oil movement under hurricane conditions. Focusing his work on two and three dimensional models of waves, currents, and transport systems, Dawson has played a key role in the development of the Advanced Circulation (ADCIRC) model and is a vanguard in the use of Lagrangian particle tracking code. With much of his work focused on hurricane storm surge in the Gulf of Mexico, Dawson is a respected thinker in the world of nearshore water modeling. The SIAM Geosciences group formed around 20 years ago and has about 500 members worldwide. They meet every other year. Dawson is only the third recipient of the Career Prize, first awarded in 2009. 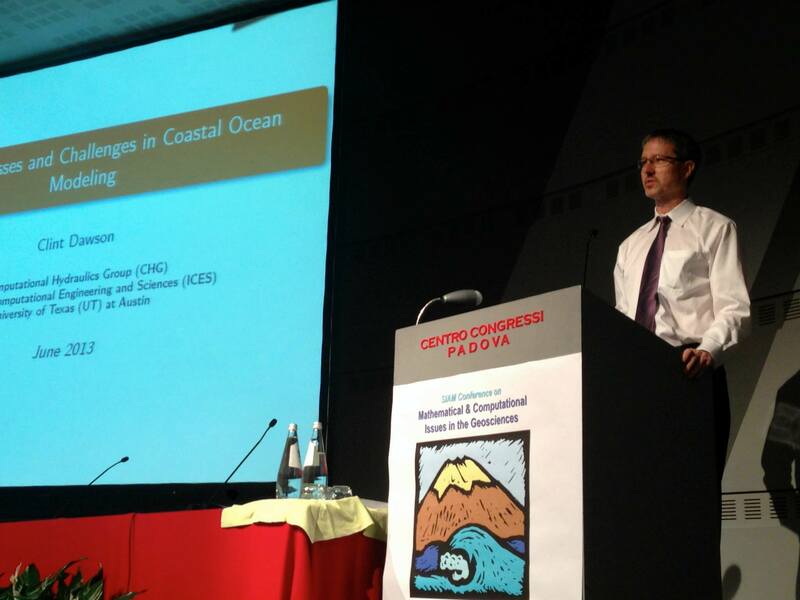 SIAM invited Dawson to present a plenary lecture at the conference as part of the award. He used this opportunity to discuss challenges in coastal modeling, particularly with regard to oil spills. The Gulf of Mexico Research Initiative (GoMRI) funds the Consortium for Advanced Research on Transport of Hydrocarbon in the Environment (CARTHE) research program. GoMRI is a 10-year, $500 million independent research program established by an agreement between BP and the Gulf of Mexico Alliance to study the effects of the Deepwater Horizon incident and the potential associated impact of this and similar incidents on the environment and public health.